Room 18 toilet sprang a leak last week. One poor soul was interrupted mid-flow by a crack when the water feed pipe into the base of the cistern snapped from the collar of the float valve inlet. Anyway, long story short, this 6am nightmare was temporarily resolved when we finally were able to shut off the water flow and mop up the water with towels. So, you’d think it would be a case of replace the broken part and bingo! Well, no, this is Higham. In fact, the float valve was replaced with a new one (I had one left), but there was something preventing the feed pipe from properly reconnecting. I gave up at that point and threw myself on the mercy of Lawrence, who I had tried not to bother because he was up to his neck in Bungalow renovations! One upon a time, a shower fitter had driven a nail through paneling and into the water pipe behind. 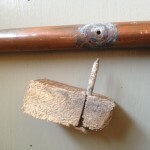 Lawrence spotted that the reason the feed pipe was restrictive was, about 20cm away where it was routed behind the shower, it had a nail in it – and moving the feed pipe to fit it to the new float valve inlet had dislodged the nail, which had been happily sitting there for decades behind the shower. So, to fix a broken loo, we’ve had to break into a shower… which now needs its wall repairing before it is used again. You can sense the frustration can’t you? All because many years ago, some careless ‘person’ had driven a nail accidentally into a pipe. 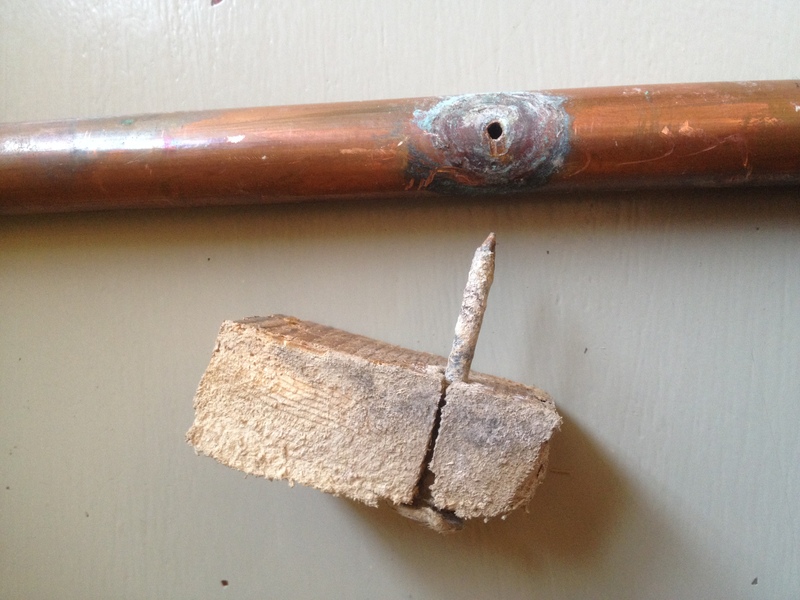 Not only are holes not good in copper pipes, but nails don’t necessarily get on chemically with copper, so, in essence, whether the pipe were dislodged or not, a leak had occurred there anyway. Obviously after the dislodging it was an even bigger leak! Why do I bother recording this? Surely this is just part of the life of Higham? Well, we have to learn from past mistakes, whenever they were made. Shoddy workmanship way back has now reared its ugly head (again) and has resulted in damage beyond just the unit it was installed in. The Bar below now has damage to the ceiling and wall. On the bright side, the loo is working again! Almost every time we have had to sort one of these problems out, it has turned out to have been caused more by past carelessness than failure of parts. Room 21 shower never worked properly until we found out that – guess what – a nail had been driven into a pipe years ago. So, we are encouraged in our approach in sorting out the Bungalow properly … and for taking our time with other improvements. Frustratingly, we know that part of the “Forth Road Bridge” nature of the premises is that we will never have done everything. However, if the words of this blog survive for posterity, one day, a future Principal of Higham Hall will recognise that we endeavoured to mitigate problems as much as we we able to do. This means, in essence, that it is not a case of repairing, refurbishing and going away, or even of simply covering up. It is about taking time to work out what is best. Examples are the holes in the walls of bathrooms in Room 7 and Room 10. These are for different reasons, but rather than just patch up and hope the problem does not recur until someone else has to sort it out, we are considering how we can properly sort these things out. In the case of Room 10, the whole bathroom needs rethinking in reality. Room 7’s bathroom wall below the window has suffered years of moisture behind plaster, meaning it never properly dried out and we have gone back to the original horse-hair material – a sheet covers its modesty. The wall will be clad internally eventually, with a surface that will allow the wall to continue to stay dry. At the moment though, we have other priorities and will get round to certain things later – they may be cosmetic travesties, but they workings are safe and operational. Whilst paneling of a wall looks not too brilliant, it is also a reminder of the age of our building and the forces within it which mean we cannot just gloss over things and ignore them. This is, of course, why certain hotel chains build new and refurbish after a few years. Unfortunately Higham doesn’t have that luxury and we have to be realistic about what we can and should do. Fortunately, we have understanding people who acknowledge the challenges we face in the real world and help us through patience and continuing to put up with little things like the odd pipe burst.All this is part of, in a strange way, co-operating with the building herself … as we would walk more carefully with a friend who had a dodgy knee, we progress tenderly with Higham Hall!